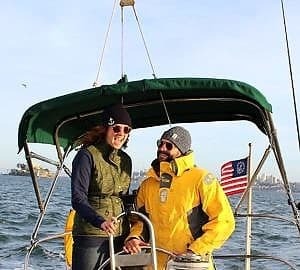 Whether you’re looking to connect with sailing crew, bluewater cruisers, or sailing singles, there are now dozens of ways to meet other sailors online and out on the water (see our list of 12 ways to meet other sailors at the end of this post). 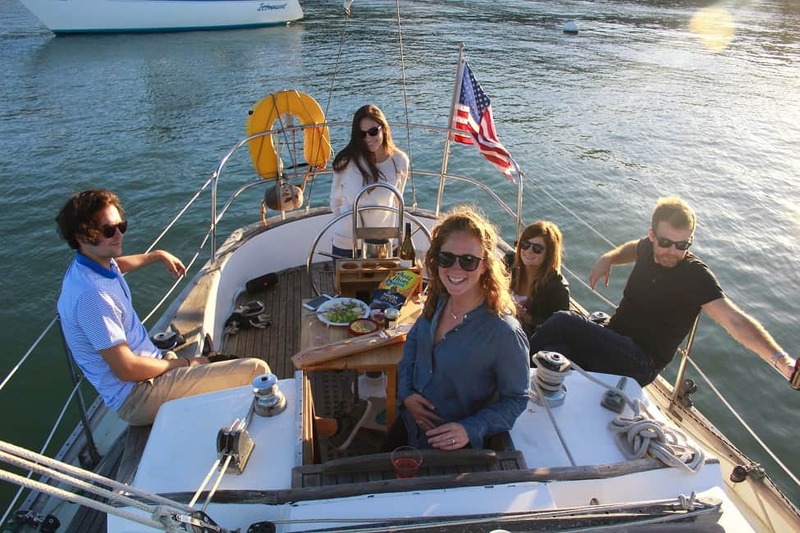 Audrey Ruhland of Thisldu shares how she found her sailing community in the San Francisco Bay Area. I hail from the shores of the East Coast, where sailing is woven into the fabric of society. My childhood was decorated with colorful buoys dangling from shingled storefronts, the low hum of a fog horn cutting through the night. From the shore, I watched kids my age wrangle Hobie Cats and tip over fearlessly in dinghies. I never once thought, “that might be me one day.” My parents didn’t sail and I didn’t have friends with boats. It was that simple. And to be honest, other than admiring pretty white sails puff up with wind in the distance, sailing never really crossed my mind. Fast forward 15 or so years—I’ve now made my way to the West Coast, San Francisco to be exact. And I co-own a sailboat with my husband. Our first sailboat was a MacGregor 27 that was moored in East Greenwich, Rhode Island, about a twenty-minute drive from our home in Newport. That boat was 99.9% projects and 0.01% sailing; honestly, I think it only left the mooring ball twice. Still, we were besotted. Both of us loved spending summer nights on that sailboat, listening to fish jump and watching bioluminescent jellyfish float through the tiny cove. It was like a little haven, a space for us to get away from our jobs, our families, our responsibilities. The solitude that it offered felt special, for the most part; but sometimes, it felt like isolation. It was just me, Garrett, and a boat. We were connected to one another, but that connection didn’t go beyond the three of us. We still weren’t a part of a sailing community. We soon found ourselves sitting across the table from Marc and Doreen, a couple who had spent 5 years circumnavigating the globe with their two children. They, like some of our friends, said, “You should meet this person,” or, “I’ll introduce you to this couple.” They shared advice and gave us the names of organizations that we could volunteer with. 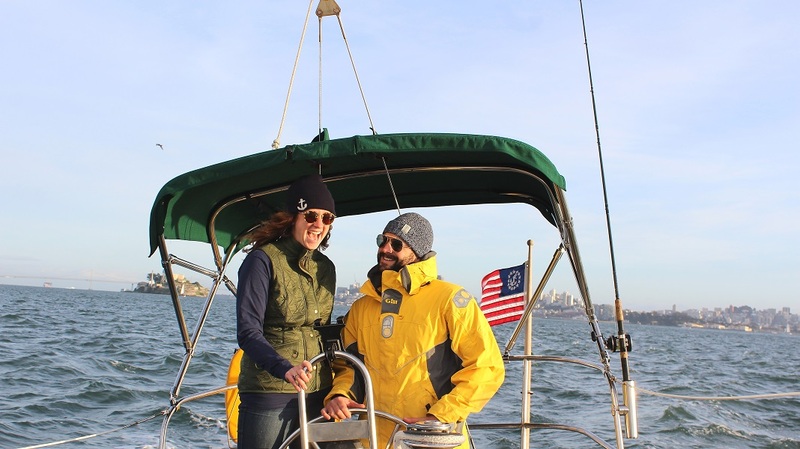 A week later, Garrett was sailing crew for Marc on a sailboat for the Blue Water Foundation, a non-profit organization that gets Bay Area kids on the water. What he lacked in skill he made up for in strength, smarts, and the willingness to help. Garrett was out sailing with Nick that weekend. Now, years later, Nick has sailed from San Francisco to the South Pacific; we even joined him for a week to sail around Cabo San Lucas and San Jose del Cabo. Nick connected us to people like Artem, who we temporarily went in on a Ranger 27 with, until we found our own boat a few months later. All of the sudden, before we even had our own sailboat, we had a sailing community. It’s not always easy to build relationships with other people around common interests – remember, we were isolated in our sailing endeavor in Rhode Island – but in San Francisco, our community was flourishing. And then something wonderfully unexpected started to happen: our community began expanding beyond the Bay Area and across the globe. We were connecting with other Rafiki 35 owners by email and Facebook, with traveling sailors through Instagram. We found a cluster of Facebook groups to further connect with people on common threads. I just joined the Women Who Sail group and can’t wait to be inspired by some badass women sailors. A few weeks from now, I’m going to host an in-person meet up for the Bay Area sailors that I only “know” from Instagram. I think it’s safe to say that the sailing community has always been strong, but not as accessible. Until a few years ago, I felt as though sailing was reserved for the few who were born into it, could afford it, or both. Now, that girl who used to watch sailboats from the shore and shrug, “That’s not for me,” is connected with more sailors around the world than she ever thought possible. So much of that is owed to the movement of sailors getting online and sharing their experiences through pictures, videos, and blogs. This social revolution has rendered the sport inclusive of all types of people from all types of backgrounds, and I hope it never stops. 1. Join a sailing crew pool for the race season. Call your local yacht clubs to see if they offer crew pools (you do not need to be a yacht club member to participate). 7. 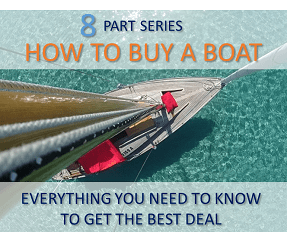 Own a boat? 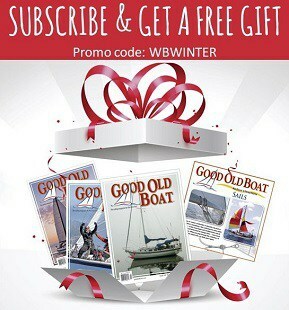 Join owners forums and sites for popular boats like Catalina, Beneteau, Hunter, etc. 8. Join a sailing Facebook group or page like Women Who Sail, Sailing and Cruising, Young & Salty, etc. 9. Discover what other young cruisers are up to via their sailing vlogs. See Young & Salty’s BIG list of sailing vlogs. 10. Meet other sailors via Instagram: Here are some of our favorite accounts to get you started: @morninggloryblog, @thesailingyogi, @brookebasspdx, @svprism, and of course, @thisldu! 11. Go on a sailing date! 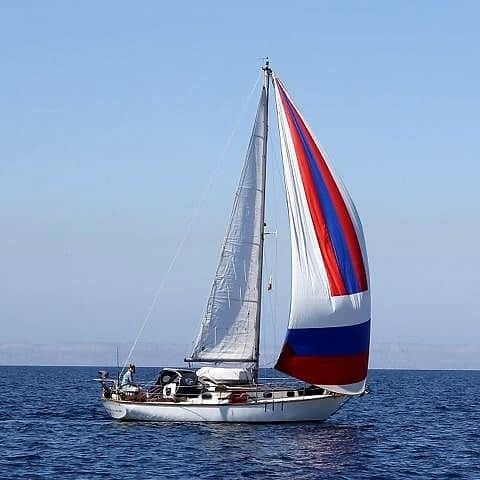 Connect with other sailing singles on LoveSail, an online dating site for sailors! 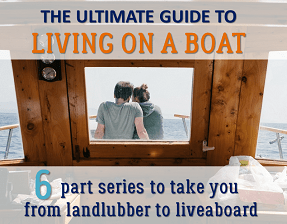 Can you think of any other ways to meet other sailors that should be included in this list? Let us know in the comments below. Whether you’re looking to connect with sailing crew, bluewater cruisers, or sailing singles, there are now dozens of ways to meet other sailors online and out on the water.